* NOTE: Please don't drink and drive. And definitely do not hold a kegger in the back of your SUV, no matter how valid the reason for said kegger may be. I pulled around and placed my order, thinking this was going to be another one of my random "chance encounters". As I pulled up and gave the girl my bank card, she glanced at the magnet on my rear driver side door. Erin had one made for each of our cars at VistaPrint and I have had it on my car ever since we got them. "I've been to that site", she said in a friendly tone (bolded emphasis mine). Who cares? Did you hear what she said?! Did you ever think you should quit listening to yourself creating some kind of creative dialogue and come up with something to say back to her? There are a lot of people who read this blog. There are the friends and family scattered throughout the world who follow so closely that they ask me if everything is OK if a recent update has not been posted. There are the people, both known and unknown, who have read and offered to help through giving of finances, prayers, well-wishes, and support. There are the friends who read and, even though they don't post public comments, they assure me privately that our family is in their daily thoughts and prayers. And then, there are the "chance encounters" ... like a friendly drive-thru girl who was kind enough to mention that you read this blog as you handed me my 99 cent chocolate shake. As much as I enjoy knowing all of you, it was that final moment where my heart cheered loud enough to make my sweet tooth and wallet jealous for the rest of the drive home. So, let me take the opportunity to say to the friendly Drive-Thru girl at the Cookout on Bruton Smith Blvd. in Concord, NC, along with everyone else out there, a sincere "Thank You" for reading. You are appreciated. That is an awesome, awesome story. 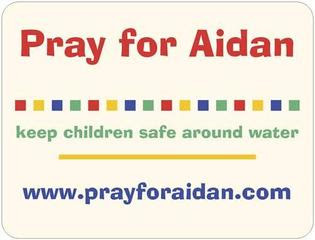 I hope you are able to meet tons and tons of people who pray for Aidan. And will be able to tell them how much more healed he is all the time.